For those who are not familiar, I started a series two weeks ago called Turnover Tuesdays. Every Tuesday I would like to highlight one item that I have resold. This will include profitable and non profitable sales. I hope that there is always something to learn. I also joined a $20kChallenge in which I will try to resell $20,000 of merchandise at a profit. I hope to have an update on my first two weeks soon. For all those who don't know, one of the best reselling blogs out there is Big Habitat. Big Habitat recommended buying iPad Mini 3s 16GBs in store at Staples because there was a $100 coupon. After the coupon they were selling for $299 or $326.62 after tax. On Amazon, they were selling for about $355. I decided to buy 2 of them. According to the Fullfillment by Amazon Calculator, if they sold for $355, there would be a $21.32 fee. This was an in store deal so no shopping portal miles available. I used a Chase United credit card since I was trying to hit a threshold for a sign up bonus. I earned 326 x 2 = 652 miles. I would have used a Chase Ink card but I did not have access to one at that time. My numbers would be far better if I did. Amazon charged me $4.54 for shipping and $21.30 x 2 =$42.60 for FBA fees. I was able to sell each iPad for $355. I decided to continue buying the same iPads, except this time I decided to use discount gift cards to pay. I bought 2 more. The first one I bought using a discount gift card I bought from Raise.com for about 4.8% off. Instead of paying $326, I now paid $311.14. Everything else stayed the same except I paid $15 less. Instead of earning $2.54, I earned about $17.. I earned 311 miles instead of 326, but I still gained the same $5.26 in Staples Rewards. Then I bought another using a discount gift card from this deal, among other gift cards. Now I paid about $300 so my profit was around $29, which is close to 10%. Best of all, by the time I was done buying all 4 iPads, I am now a Staples Premier member so I get 5% in Staples Rewards on any future purchases. 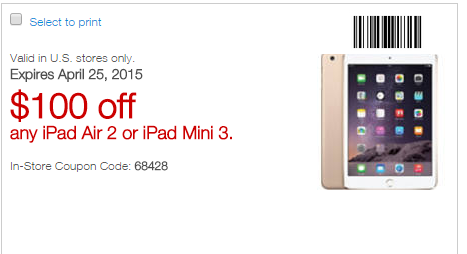 Best Buy had a 3 hr flash sale where they were selling iPad mini 3's for $249. My price went down to $267 after tax! I was only able to sell it for $340 this time, but my profit was over $46 and I also got $5 in Best Buy Rewards. Then I got $13.37 from the Discover Shopping Portal. I also had a targeted bonus of 3 American Airline miles per $1 spent at Electronic stores so I got over 750 American Airline Miles as well. I bought 5 iPad Mini 3s total. All of them were 16GBs. If I did the same purchase now, I would earn over $60 of Staples Rewards because I am now Premier status because of these purchases. If you input a value of $0.01 per mile, you come out with a total profit of $158.63 on $1,531.87 of spending. That's a margin that's slightly greater than 10%!